Whether you've been in the US for 20 minutes or 20 years, you know that the ongoing investigation led by Special Counsel Robert Mueller -- unraveling the Russian government's interference in Protected content presidential elections -- is one of the most consequential happenings of our time. Every week, new clues emerge, new indictments are handed down, and new Tweets spew forth from the current resident of the White House. How can we keep track and make sense of this all, without losing our minds? Fortunately, there's a podcast for it! 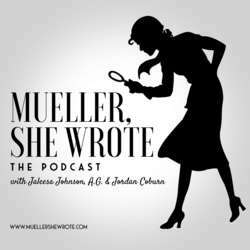 "Mueller She Wrote" is hosted by three smart and talented women who use humor and snark to not just outline what happened to whom each week in the scandal of the century -- but help us connect the dots. They will be recording in front of a live audience in NYC for the first time -- and you can be there to stay informed while laughing along. Click on link in the location field, above. IMPORTANT: Buy tickets for the "General Admission" session -- i.e., for the show itself. There is a mix of standing and sitting room. Arrive no later than 18:30 to position yourself for seating. I CANNOT and WILL NOT "hold" or "save" seats in this venue, for anyone. If you arrive with the rest of the group, there is a better chance of our sitting together. NO-SHOWS are NO FUN! Do not RSVP on this page if you do not buy tickets in advance. I know who you are, and Robert Mueller will know who you are!